Trump envoy fires back after PA chairman's spokesman blasts US support for "settlements". Jason Greenblatt, US President Donald Trump's Special Representative for International Negotiations, on Wednesday criticized Palestinian Authority (PA) chairman Mahmoud Abbas’ spokesman and said he was sabotaging efforts to achieve a peace agreement between Israel and the PA.
“And the Palestinians deserve stability too. You’re holding that back as well. Don’t waste more time – do something meaningful for your people,” added the US envoy. In recent weeks, Greenblatt has taken PA officials to task several times over their continued resistance to restart peace talks with Israel. Last Saturday, Greenblatt responded to Palestine Liberation Organization (PLO) official Hanan Ashrawi, who asserted that US officials were engaging in diplomacy through Twitter. “Dr. Ashrawi- my door is always open to the PA & Palestinians to speak. In fact, I’ve met many Palestinians over the past 14 months & continue to. I’m happy to meet anytime- you, Saeb [Erekat] & all your colleagues are ALWAYS welcome to visit me at the White House to speak in person,” he wrote. A day earlier, Greenblatt fired back at Abu Rudeineh after the spokesman bemoaned the US cut in aid to the PA, which the PA itself had requested. 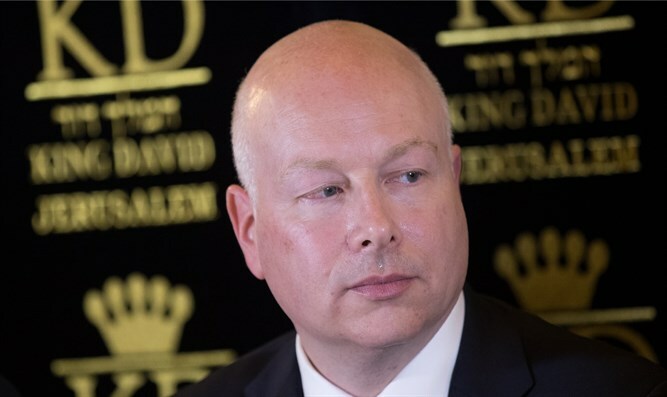 Greenblatt, along with President Trump’s senior adviser and son-in-law Jared Kushner, have been working on a peace plan for Israel and the PA. While the plan has yet to be unveiled, and will likely not be made public until after the Israeli election in April, the PA has rejected the plan outright and has been boycotting the US ever since President Donald Trump’s recognition of Jerusalem as Israel’s capital in December 0f 2017.